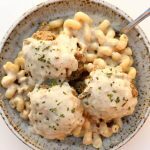 Chicken meatballs are served alongside pasta with an easy, homemade alfredo sauce. Pasta, meatballs and sauce are all cooked in one pot–your Instant Pot. Add chicken broth, garlic powder and pasta to the Instant Pot in an even layer. In a bowl add the ground chicken, bread crumbs, egg, oregano, paprika, garlic cloves, parmesan, salt and pepper. Use clean or gloved* hands to combine the mixture. Form into meatballs. I made my meatballs fairly large, probably about ⅓ cup each. Place the meatballs on top of the pasta in one layer. Cover the pot and secure the lid. Make sure the valve is set to “sealing.” Set the manual/pressure cook button to 5 minutes on high pressure. When the time is up let the pot sit for 5 minutes (display will read L0:05). Move the valve to venting. Open the pot. Use a spoon to scoop the meatballs onto a platter. Turn the Instant Pot to the saute mode. Add warmed half and half, parmesan cheese, salt and pepper into the pot. Stir. If you want your sauce less runny you can thicken it with a cornstarch slurry. Mix 1 Tbsp of cold water with 1 Tbsp of cornstarch until smooth and stir the mixture into the pot. The sauce will thicken fairly quickly. Serve pasta and sauce with the meatballs. You can easily double this recipe. Double all the ingredients and keep the cooking time the same. I used cavatappi pasta but you can also use penne or cellentani pasta.